1. Department of Digestive Surgery, Breast and Thyroid Surgery, Kagoshima University School of Medicine, 8-35-1 Sakuragaoka, Kagoshima 890-8520, Japan. 2. Department of Clinical Oncology, Kagoshima University School of Medicine, 8-35-1 Sakuragaoka, Kagoshima 890-8520, Japan. 3. Kagoshima University Graduate School of Health Sciences, 8-35-1 Sakuragaoka, Kagoshima 890-8520, Japan. Background: It has been reported that anatomical resection of the liver may be preferred for primary hepatocellular carcinoma (HCC), and is at least recommended for systematic removal of a segment confined by tumor-bearing portal tributaries. However, nonanatomical resection (NAR) is often selected because of the patient's background, impairment of liver function, and tumor factors. The aims of the present study were to retrospectively compare the recurrence-free survival (RFS) rates for cases of partial resection (PR) and for small anatomical resection (SAR), which is regarded as NAR for primary HCC with impaired liver function. Patients and Methods: So-called NAR was performed for a primary and solitary (≤ 5cm) HCC in 47 patients; the patients were classified into PR (n=25) and SAR (n=22) groups. Clinicopathological factors, survival data, and recurrence patterns were compared between groups. Results: There were no significant differences in the preoperative characteristics between the two groups. Operative time was significantly longer in the SAR group than in the PR group. There was no significant difference in the postoperative morbidity and tumor pathological characteristics between the two groups. The RFS of the SAR group was significantly better than those of the PR group. Although there was no significant difference in the pattern of recurrence between the two groups, the rate of intrahepatic recurrence in the same segment as the initial tumor tended to be higher in the PR group than in the SAR group. Multivariate analysis revealed that only the PR operative procedure was significant independent risk factor for poorer RFS. Conclusion: Compared with PR, SAR effectively improves the rate of RFS after surgery for a primary and solitary HCC with impaired liver function. It has been reported that anatomical resection (AR) of the liver may be preferred for primary hepatocellular carcinoma (HCC), and is at least recommended for systematic removal of a segment confined by tumor-bearing portal tributaries [1-4]. We also reported that AR of a solitary HCC was superior to nonanatomical resection (NAR) or ablation therapies, in association with overall and disease-free survival . However, NAR such as partial resection (PR) and enucleation is often also selected, with consideration of patient background variables, including comorbidity, the degree of impairment of liver function, tumor location, and extent of tumor spread. "Subsegmentectomy" in Couinaud's classification  is regarded as NAR under Japanese general guidelines . Couinaud's subsegment appears to comprise the liver parenchyma fed by the 4th order portal vein branch or by one of several 3rd order portal vein branches flowing into the same segment. Since 2006, we have aggressively employed resection of small anatomical divisions based on three-dimensional (3D) images as an alternative to PR for patients with impaired liver function. We identify the 3rd or 4th order portal vein territory feeding the domain using indocyanine green (ICG) or blue dye injection under intraoperative ultrasound (US) guidance, in order to improve the prognosis. 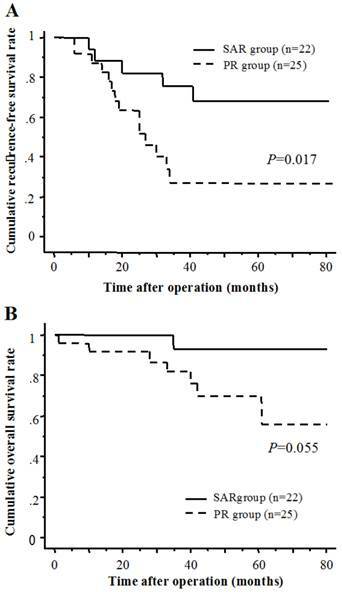 The aims of the present study were to retrospectively compare recurrence-free survival (RFS) rates for PR and small anatomical resection (SAR) for primary and solitary HCC of 5cm or less with impaired liver function, and to elucidate the impact of SAR on recurrence after curative surgery, based on new imaging studies. Flow diagram of therapeutic methods for patients with a primary, solitary and ≤ 5cm HCC. A total of 158 patients with a primary and solitary HCC of 5cm or less underwent curative hepatic resection in our department between January 2005 and December 2013. Among these, 111 patients underwent AR, and 47 with impaired liver function or severe comorbidity underwent NAR. AR was defined as hepatectomy more than segmentectomy in Couinaud's classification  or the Brisbane 2000 Terminology , which is the same as subsegmentectomy in the Japanese general guidelines , and SAR was defined as hepatic resection of the small anatomical territory feeding from the 4th order portal vein branch or one of several 3rd order portal vein branches that flow into the same segment. The 47 patients in this study who underwent NAR were divided into PR (n=25) and SAR (n=22) groups (Fig. 1). A history of the presenting illness was obtained for all patients and a complete physical examination was performed. A self-administered questionnaire was used to gain information on previous medical history. Excessive alcohol consumption was defined as an average daily consumption of an amount equivalent to 80 g of pure ethanol over a period of >10 years. Diabetes mellitus included patients whose blood sugar levels were controlled with medication. Patient infectious status for HBV and HCV (hepatitis B and C viruses) was determined by testing for hepatitis B surface antigen and hepatitis C antibodies. Liver function was assessed by liver biochemistry testing, Child-Pugh score, ICG retention test (ICGR15), and technetium-99m-galactosyl human serum albumin scintigraphy [9, 10]. Tumor progression and resectability were assessed with imaging studies, such as contrast enhanced computed tomography (CT), magnetic resonance imaging, and ultrasonography. Around 2006, 3D simulation software packages (Virtual Place, AZE Company, Japan; Synapse Vincent, Fujifilm Corporation, Japan) were introduced in our institution. The 3D images of the portal vein, hepatic vein, and tumor were also made preoperatively, based on multidetector CT, and segmentation or subsegmentation was performed. Informed consent of therapeutic protocols and use of clinicopathological data for this study were obtained from all patients. The extent of liver resection was largely determined according to Makuuchi's criteria [11, 12] and the general condition of the patient. 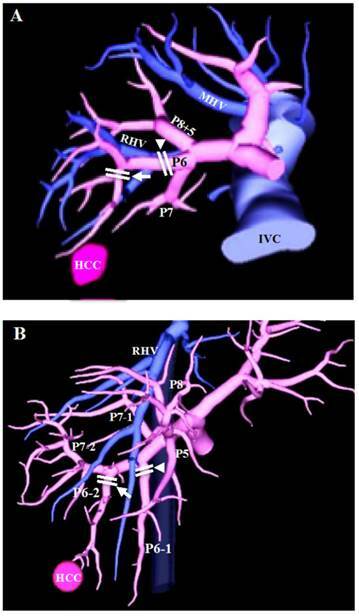 The resection method, namely, PR or SAR, was selected by considering the location and size of the tumor, the detectability of a portal vein branch on preoperative CT or reconstructed 3D images, and the tolerability of the effect on liver function for the calculated volume of the small anatomical territory including the tumor (Fig. 1). In the case of PR, a surgical margin of 5-10 mm from the tumor was secured, unless the tumor was attached to the hepatic vein or the glissonian pedicle to be preserved. In the case of SAR, the portal pedicle supplying the tumor is detected by preoperative CT and reconstructed 3D images. Then, by selecting the root of the 4th order portal vein branch or the root of one of several 3rd order branches that flow into the same segment, the small anatomical territory of the portal vein is extracted (Fig. 2). If part of the tumor is outside the extracted territories, another portal pedicle nearby is selected as a second target. After laparotomy or laparoscopic approach, the target portal branch was injected with 3 to 5 mL indigo carmine dye or 2.5 mg of ICG (Daiichi Sankyo Company, Limited, Tokyo, Japan) under intraoperative US (Pro Focus Ultra View 2202, BK Medical, Denmark) guidance. When ICG was injected, the stained surface was identified using a near-infrared camera system (pde-neo, Hamamatsu Photonics K.K., Japan; IRI, Olympus Corporation, Japan) and marked using electrocautery as a transection line. The stained area was referred to the 3D image, and the anatomical relationship with the HCC also was verified. For hepatic parenchymal transection, we used an ultrasonic dissector (CUSA ExcelTM; Integra Lifesciences Corporation, Plainsboro, NJ, USA) to identify intrahepatic structures such as hepatic veins and Glissons sheaths. Exposed structures of 2 mm or less were dissected using EnSealTM (Ethicon Endo-Surgery, Cincinnati, OH, USA) and larger vessels were ligated with 3-0 braided silk or vessel clips. Pringle's maneuver (hepatic inflow occlusion time 15 minutes and reperfusion time 5 minutes) was performed during parenchymal transection. The median follow-up period was 1332 days (range, 25 to 3120 days). Postoperative complications were investigated and graded according to the Clavien classification [13, 14]. In the present study, postoperative mortality was defined as all in-hospital deaths that occurred after surgery. Postoperative follow-up consisted of dynamic CT and laboratory tests, including measurement of the serum alpha-fetoprotein (AFP), AFP-L3, and des-gamma carboxyprothrombin (DCP) levels every 3-4 months during the first 5 years after surgery. Intrahepatic recurrence (IHR) pattern was classified into: (1) recurrence in the same Couinaud's segment as the initial tumor; (2) recurrence in a different segment from the initial tumor; (3) multisegmental recurrence. Any recurrence of disease was treated as vigorously as possible. 3D images based on multidetector CT. (A) The 3rd order portal vein branch (arrowhead) for staining and dissection in Couinaud's segmentectomy, same as subsegmentectomy under Japanese general guidelines, and the 4th order portal vein branch (arrow) for staining and dissection in SAR of this study. (B) The 3rd order portal vein branches (arrowhead and arrow) for staining and dissection in Couinaud's segmentectomy, and one of the 3rd order portal vein branches (arrow) for staining and dissection in SAR of this study. PX: segmental portal vein branch of segment X; MHV: middle hepatic vein; RHV: right hepatic vein; IVC: inferior vena cava. Differences between the two groups were analyzed by using the unpaired t test for continuous variables and the χ2 test for categorical variables. The continuous data are presented as the mean plus range, except for AFP, DCP, operative time, and intraoperative blood loss. Recurrence-free and overall survival curves were calculated with the Kaplan-Meier method and compared by using the log-rank test. Risk factor analysis for recurrence was performed by the Cox proportional hazards regression test. The cutoff values for continuous data in univariate and multivariate analysis were defined as median values. Only significant variables in univariate analysis were included in the multivariate analysis. A p value of less than 0.05 was considered to be significant. The preoperative characteristics of both groups are shown in Table 1. There were no significant differences in the preoperative characteristics and the liver function variables, such as the ICGR15, Child-Pugh classification, or grade of liver damage between the two groups. Table 2 shows the surgical outcome and tumor characteristics for both groups. The most common tumor locations were segment VI and VIII in the PR group, and were segment VI in the SAR group. Operative time was significantly longer in the SAR group than in the PR group. There was no significant difference in the postoperative morbidity between the two groups. However, one patient who underwent PR for a solitary HCC located at the border between segment IV and segment VIII died 39 days after the operation because of postoperative hemorrhage and liver failure. There were no significant differences in tumor size, gross classification, microscopic vascular invasion, or differentiation of the tumors between the two groups. The surgical margin was significantly smaller in the PR group than in the SAR group. BMI: body mass index; ICGR15: indocyanine green retention rate at 15 min. Main location of the tumor, no. pv: portal vein; hv: hepatic vein. The cumulative 1-, 3-, and 5-year RFS rates were 87.3, 26.8, and 26.8 % in the PR group, and 88.5, 75.4 and 67.8 % in the SAR group, respectively (Fig. 3A). The cumulative 1-, 3-, and 5-year overall survival rates were 92.0, 82.0, and 69.8 % in the PR group, and 100, 92.9, and 92.9 % in the SAR group, respectively (Fig. 3B). There was a significant difference in the recurrence-free survival rates between the two groups. The patterns of recurrence are shown in Table 3. The rate of recurrence was significantly higher in the PR group than in the SAR group (P=0.002). There was no significant difference in the number of tumor recurrences. The sites of extrahepatic recurrence (EHR) were lung in the PR group, and local dissemination in the SAR group. IHR in the SAR group was significantly less than in the PR group. Although there was no significant difference in the pattern of IHR between the two groups, the IHR in the same segment as the initial tumor tended to be greater in the PR group (12%) than in the SAR group (4.5%). The locations of recurrence in the same segment as the initial tumor were dispersed. (A) Recurrence-free survival of SAR group and PR group. (B) Cumulative overall survival of SAR group and PR group. as the initial tumor, no. The results using the Cox hazards regression test for risk factors of recurrence are shown in Table 4. In the univariate analysis, positivity for hepatitis C virus antibodies, AST ≥38 IU/L, ALT ≥32 IU/L, AFP ≥10 ng/ml, and PR were significant factors for a poorer RFS rate. The multivariate analysis revealed that the PR operative procedure remained as a significant independent risk factor for poorer RFS. RFS: recurrence-free survival; CI: confidence interval. The beneficial effects of AR for HCC have been shown in terms of postoperative survival and disease-free survival [1-4]. In these reports, it is reported that vascular invasion of tumor and intrahepatic metastasis were among the risk factors that most strongly influenced the postoperative prognosis, and AR was recommended as a procedure for efficient eradication of minute cancerous foci with a main tumor and intrahepatic metastasis. We also reported that AR of a single HCC less than 3 cm in diameter was superior to NAR or ablation therapies with regard to overall and disease-free survival, and the effect of AR was more prominent in the subgroup of HCCs with extranodular growth . On the other hand, some authors have not been able to demonstrate significant survival benefits for AR [15-17]. In these reports, it is reported that the postoperative recurrence patterns were similar in the NAR and AR groups, and neither NAR nor AR can prevent multicentric recurrence or carcinogenesis. Thus, the debate surrounding anatomical versus non-anatomical resection remains controversial. In the present study, we retrospectively compared the RFS for the PR group and for the SAR group, which is regarded as NAR for a solitary HCC of 5cm or less with impaired liver function, and evaluated the impact of SAR on recurrence after curative surgery. HCC has a tendency to metastasize via the portal vein, and the resection of liver parenchyma fed by portal venous branches bearing the tumor is considered to be a logical method for eliminating potential intrahepatic metastases . Therefore, we thought that AR should be considered for improving surgical outcome, and AR was performed for primary HCC, where possible. However, NAR such as partial resection and enucleation was also selected often by considering patient background variables, including comorbidity, the degree of impairment of liver function and tumor factors. Anatomical segmentectomy and subsegmentectomy have been proposed as a means of improving curative surgical treatment for HCC and preserving liver parenchyma in patients with impaired liver function [2, 19]. In a typical anatomical resection method such as segmentectomy, the surface of the segment area is marked according to the area stained after injection of blue dye under intraoperative US guidance [19, 20]. Aiming at improvement of prognosis with NAR, we have aggressively employed resection of small anatomical divisions as an alternative to PR for patients with impaired liver function; the method employs identification of the 3rd or 4th order portal vein territory feeding the domain using dye injection under intraoperative US guidance. 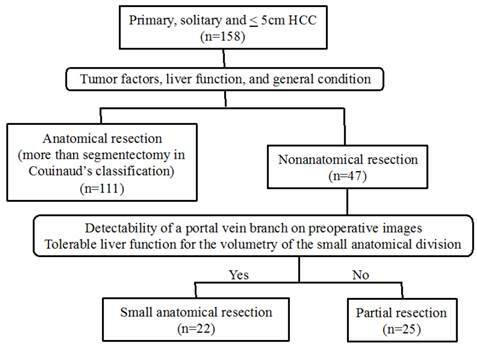 In this study, the resection method was selected by considering the detectability of a portal vein branch and the tolerability of the effect on liver function for the calculated volume of the small anatomical territory including the tumor on preoperative images. Therefore there was a possibility that selection bias existed between the two groups, but there were no significant differences between groups in the preoperative characteristics and the liver function variables, such as the ICGR15, Child-Pugh classification, or grade of liver damage. The most tumor common locations in the PR group were segment VI and VIII. Although segment VIII resection or the resection of the ventral or dorsal portion, i.e., subsegmentectomy can be anatomically performed using a staining method and full exposure of the landmark vessels [2, 19-21], the volume of segment VIII calculated by 3D perfusion-based volumetry represented the largest proportion (11.1-38.0%) of total liver volume . Thus, it seems that the volume of AR and the complexity of the operative procedure became problematic for patients with impaired liver function; consequently, PR was often selected in segment VIII. The branching variations of the portal vein in segment V (P5) and VI (P6) were complicated. The number of P5s ranged from one to six, and the branching of P6 was classified into a bifurcation type, a direct bifurcation type from the right portal vein, and a bow-shaped type . The staining of portal vein territory under intraoperative US guidance in segment V or VI was relatively easily achieved. Therefore, many tumors in segment VI and V underwent SAR in this study group. In this area, laparoscopic or laparoscopic-assisted hepatectomy seems easily compared with upper segment, e.g., segment VII and VIII; we had reported the value of pure laparoscopic or laparoscopic-assisted SAR using puncture of the portal vein branch with dye injection under US guidance [23-25]. For precise puncture of the target portal vein, it is important to establish the anatomical relationship between the HCC and the surrounding structures preoperatively. Preoperative simulation using 3D images based on multidetector CT is useful for identifying the anatomical relationship between the tumor and the portal branch and comparing the intraoperative staining area with the planned resection area [23-25]. Mise et al. reported that Couinaud's eight segments vary significantly in territory and volume, and have variable patterns of portal vein branching. Therefore, perfusion-based 3D is a useful tool for preoperative evaluation when planning anatomic segmentectomy . 3D simulation appears essential for identification of the portal vein territory and accurate anatomical resection. The present study revealed that SAR was superior to PR in terms of recurrence-free survival in patients with a solitary HCC of 5cm or less. There were no significant differences in the number of tumor recurrences and the rate of EHR. Previous studies reported that EHR after curative hepatectomy occurred in 7.2-15.5% of patients [26-30], and the incidence of EHR was similar between the AR and the NAR group [29, 30]. In this study, EHR was found in one patient (4%) of the PR group concomitant with IHR, and in one patient (4.5%) of the SAR group without IHR. In fact, 14.4% of the 111 patients with a primary and solitary HCC who underwent AR in our department developed EHR. Several studies reported that significant independent risk factors for EHR included microscopic hepatic vein invasion [26, 27], microscopic portal vein invasion , intraoperative blood loss  and tumor invading the capsule . The patient with EHR in the PR group had microscopic portal vein invasion, and the patient with EHR in the SAR group had hepatic vein invasion. All initial tumors of two patients with EHR showed tumor capsule invasion. Intraoperative blood loss in two patients (815 ml and 1120 ml) was also greater than the median value for all patients in this study. Several studies reported that hematogeneous dissemination was the main presumed mechanism of extrahepatic spread [26, 27, 31]. Thus, it seems that there is always a chance that malignant cells may spread systemically in patients with vascular invasion, and the selection of the surgical method may not influence the incidence of EHR. IHR is the most frequent mode of HCC recurrence; the IHR pattern in this study was classified into (1) recurrence in the same Couinaud's segment as the initial tumor; (2) recurrence in a different segment from the initial tumor; and (3) multisegmental recurrence. Although there was no significant difference in the pattern of IHR between the PR group and the SAR group, the IHR in the same segment as the initial tumor, and in the different segment from the initial tumor tended to be greater in the PR group than in the SAR group. One of the major forms of IHR is metastasis via vascular invasion, because HCC has a high propensity to invade the portal and hepatic veins . Therefore, the removal of the area fed by the portal venous branch bearing the tumor and the securing of the surgical margin as long as possible should be recommended, even if liver function is impaired. On the other hand, multicentric carcinogenesis, which causes recurrence in different or multiple-segments, is considered to be uncontrollable by surgery, even by AR [29, 30]. In this study, there is a possibility that multicentric carcinogenesis in the PR group increased because of impaired liver function and the rate of patients who were anti-HCV-Ab positive (no significant differences between groups), and influenced the RFS rate. However, there is also the possibility that SAR reduced the occult tumor cells around the initial tumor, and consequently the IHR in the SAR group was decreased compared with PR. In this study, positivity for hepatitis C virus antibodies, AST, ALT, AFP, and PR were identified as risk factors for recurrence after curative hepatectomy by univariate analysis, and PR was identified as independent risk factor on multivariate analysis. Although the SAR in this study was smaller than anatomical segmentectomy or subsegmentectomy, and is regarded as a NAR, we think that SAR can in fact be regarded as an AR, because of removal of the portal vein territory. The present study was associated with some limitations. First, the total number of patients was small in both groups. The aims of the present study were to compare recurrence after operation for primary and solitary HCC of 5cm or less with impaired liver function, so the numbers of each group were relatively small. Additionally, this was a retrospective, nonrandomized, observational study; therefore, the rates of patients with excessive alcohol consumption, with anti-HCV-Ab positive or with Child-Pugh B, and the levels of AST and ALT tended to be higher in the PR group than in the SAR group (p<0.2). Although further prospective studies are required to elucidate the true benefit of SAR, it seems that it is difficult to make clinical background, tumor factors, and strategy of operation even for prospective study in patients with impaired liver function. In conclusion, SAR is effective in improving the rate of RFS after initial and curative resection in cases of primary and solitary HCC of 5cm or less with impaired liver function compared with PR. Thus, SAR is considered to be a logical method for removal of the portal vein territory and a useful procedure for increasing the curative success rate.